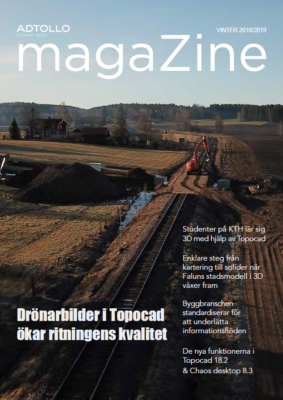 Topocad communicates directly with various surveying instruments as total stations and GPS and GNSS instruments. Leica, older systems that GRE 3 & 4, GSI and newer systems like the System 1200, VIVA and Hexagon XML. In addition, communication takes place against Leica RoadRunner and PrintfPC. Coordinates and longitudinal geometries (alignments, profiles, and camber) is imported and exported. Trimble, the older systems with GDT format (Geodat, Geodimeter) and newer systems via the DC files, JobXMLoch using Trimble systems TrimbleLink. Coordinates and longitudinal geometries (alignments, profiles, and camber) is imported and exported. Topcon, TCN files, and LandXML. Psion / GeodosCommunication is also made to machine guidance systems via the LandXML data via Topcon RD3 format and Scanlaser’s MBS format.